The new poetry book is here! Driving with the Dead is available from the University Press of Kentucky. The book is now available on Barnes and Noble and on Amazon. Also ready for Nook and Kindle! Locally, look for the book at Mr. K's Johnson City, Barnes & Noble, Johnson City, I Love Books, Kingsport, and The Merc at Emory & Henry College. Contact Jane for signed copies. Bristol Public Library: April 13, 2014 2:00. Jane will read along with friends, Janice Hornburg and Gretchen McCroskey to celebrate National Poetry Month. Down Home Pickin' Parlor: July 14, 7:00. Jane will read with poets, Hilda Downer and Melody Davis. Hear previews from the new book, due out any minute! Morris Book Shop: Lexington, Ky August 10, 2:00. 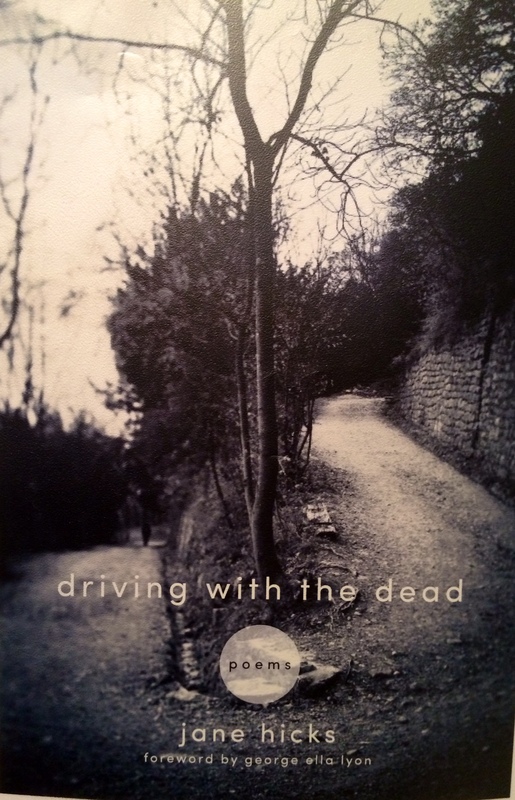 First public reading for Driving with the Dead, along with George Ella Lyon, who wrote the introduction. Southern Festival of Books: Nashville, TN, October 10-12. I will be on a panel at 3:00-4:00 on Friday, Ocotber 10, with Bill Brown. Mountain Makins Festival:Morristown, TN, October 25-26. Tales of the Lonesome Pine: Big Stone Gap, VA, November 8. Featuring writers from SAWC (Southern Applalchian Writers Cooperative). More details to follow. Check City Lights website for a podcast of this event. The Mildred Haun Conference: Walters State Community College, Morristown, TN. February 6-7. Appalachian Studies Association: East Tennessee State University, March 27-29. Panel on Saturday 28, and signing at the University Perss of Kentucky booth on Saturday at 5:00-6:00 p.m. DP Culp Center. Jack Higgs Reading Series: East Tennessee State University, Ball Hall Auditorium, April 8, 7:30-9:00 p.m. Honoring Dr. Jack Higgs, with Rita Quillen. Berea College: Community writing wrokshop. April 16. 6:30-8:30. Appalachian Writers Series: Historic, Rugby,TN, April 25, 6:30. Celebrating National Poetry Month. Mountain Heritage Literary Festival: Lincoln Memorial University Harrogate, TN. June 12-14. Jane will be leading a poetryworkshop. Milligan College: September 1, 7:00 p.m. Details to follow. Western Carolina Spring Literary Festival: April 6, 7:00 p.m.
Appalachian Reading Series: April 22, 7:00 p.m. Cumberland Gap, TN, Convention Center. Sponsored by Lincoln Memorial University and Southwest Community College and Technical School, Middlesboro, KY campus. The schedule is evolving by the minute. Check back often.